Tibetans believe that they originated from a monkey and a Raksasi, who married under the order of Avalokiteshvara and gave birth to six children, thus starting the history of Tibet. Mt. Gongpori located in the Shannan Region , is considered to be the place where the couple once lived according to a legend handed down through generations. In fact, according to the recent archeology discoveries in different parts of Tibet, the original inhabitants began to live in the highlands as early as the Palaeolithic Age. They later merged with the Qiang people, who had come the long way from Qinghai and Gansu Provinces, becoming the ancestors of Tibetans. In about 237 BC, a tribe by the Yarlung Tsangpo River was unified by Nyatri Tsenpo, the first king of Tibet. It later grew into an aggressive power in the 7th century that unified all of Tibet into the Tubo Kingdom, marking the beginning of the recorded history of Tibet. Tubo Kingdom (7th Century - 877) - After Songtsen Gampo (617-650), the 33rd Tsenpo of the Yarlong Tribe, established the Tubo Kingdom, he moved the capital to Resa (presently Lhasa), created Tibetan characters and built the first Buddhist chapel in Tibet. 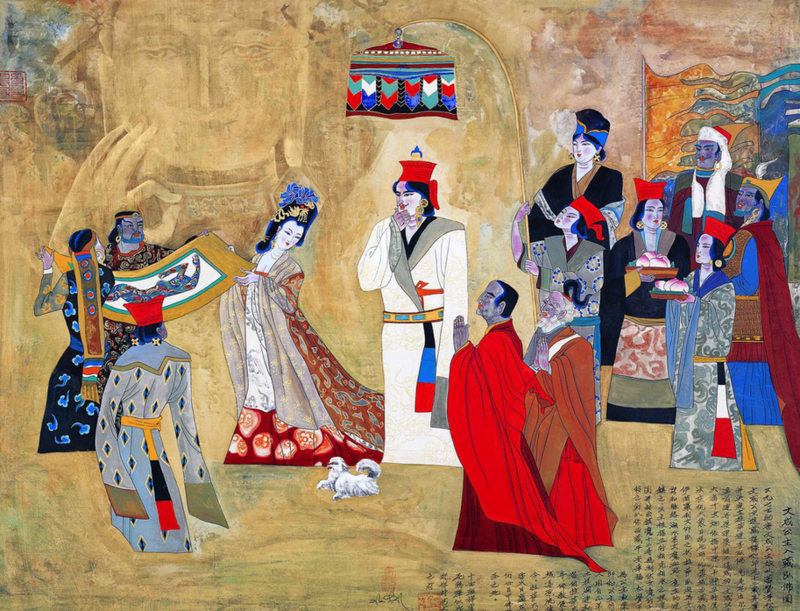 To strengthen his power, Songtsen Gampo proposed marriages to the princesses of Nepal and China?s Tang Dynasty (618-907), the latter of whom is the famous Princess Wencheng. In 641, Princess Wencheng set off from Chang’an (presently Xi’an) and arrived in Lhasa after a two-year journey. Together with her were not only the advanced technologies of agriculture, medicine and calendar development, but also Buddhist statues, sutras and the wish to promote Buddhism. 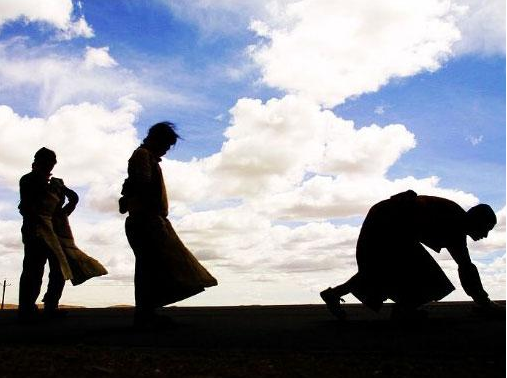 Since then more and more Tibetans converted to Buddhism; the indigenous religion of Bon , which had dominated Tibet for nearly one thousand years, began to decline. After Songtsen Gampo's death in 650, his most outstanding successors, Trisong Detsen (742-798) and King Tri Ralpa Chen (804-836), followed the Buddhist trend and allied with the Tang Dynasty. In 779, Trisong Detsen built the first Buddhist temple? 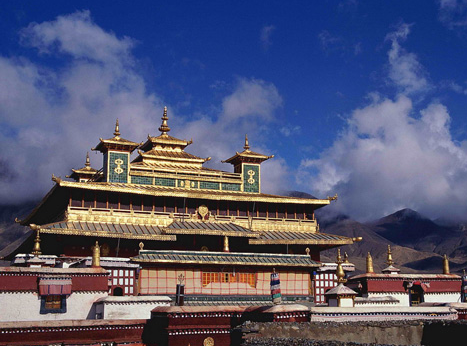 Samye Monastery, which symbolized the formal recognition of Buddhism in Tibet. In 823 during the reign of King Tri Ralpa Chen, the 'Uncle-Nephew Alliance Tablet' was erected in front of the Jokhang Temple to mark the alliance between the Tubo and the Tang Dynasties. By 836, not only had Buddhist monasteries mushroomed throughout Tibet, but the supremacy of monks expanded. Frightened by the overwhelming popularity of Buddhism, Lang Darma (797-841), the brother of King Tri Ralpa, a Bon believer, killed the king in 836 and ascended the throne. Severe demolitions of Buddhist monasteries and persecutions against monks in the following years eventually provoked massive rebellions and the assassination of Lang Darma. In 877, the rebelling armies conquered Chonggye County and destroyed the Graveyard of Tibetan Kings , ending the Tubo Kingdom and starting 400-year-long period of wars and decentralizations. Sakya and Pagdu Periods (877-1618) - About 100 years after Lang Darma's blow, Buddhism revived. In 1042, Atisha, an East Indian (from what is today Bangladesh) Buddhist sage, came to Tibet and many sects of Buddhism were founded there after. The second transmission of Buddhism was so powerful that when the Mongols rose in the early 13th century, the leaders realized that relying solely on religious influences could accelerate the unification of Tibet. In 1246, Godan Khan, grandson of the famous Ghengis Khan (1162-1227), met Sakya Pandita Kunga Gyaltsen (1182-1251) in Liangzhou (presently Wuwei City, Gansu Province) and granted the local authority to this prestigious scholar and abbot of the Sakya Monastery, in exchange for Tibet's submission. In 1260 when Kublai Khan (1215-1294) succeeded to the throne, Choygal Phakpa (1235-1280), nephew of Sakya Pandita, was appointed Imperial Preceptor and took charge of the national Buddhism affairs of the Mongol Empire and the local administration of Tibet. In 1265, Choygal Phakpa established the Sakya Kingdom, which was later incorporated as part of the Yuan Dynasty (1271-1368). The Sakya Dynasty tottered in the latter period of the Yuan Dynasty and was replaced by the Pagdu Dynasty in 1354, which also submitted to the central government of the Yuan Dynasty and to that of the Ming Dynasty (1368-1644). It was under the patronage of the Pagdu Dynasty that Tsong Khapa (1357-1419), much influenced by Atisha, and established the Gelugpa Order, the order of Dalai Lama and Panchen Lama. In 1578, the title of 'Dalai Lama' was first conferred on Sonam Gyasto (1542-1588) by Altan Khan, a Mongol chief who is known for re-introducing Buddhism into Mongolia. In 1587, the title of 'Dalai Lama' was officially admitted by the Ming Dynasty, with Sonam Gyasto being known as the third and his two predecessors being posthumously admitted as the first and the second Dalai Lamas. Initially given by Gushri Khan, chief of the Qosot Mongols, the title of 'Panchen Lama' started with Lobsang Choekyi Gyaltsen (1567-1662), the fourth Panchen Lama, with the former three being posthumously admitted. Ganden Podrang Regime and the Autonomous Region of Tibet (Since 1642) - The Pagdu Dynasty was ended by the Karma Regime in 1618, which existed for only 24 years. Oppressed by the king who carried out hostile policies against the Gelugpa Sect, Lobsang Gyatso (1617-1682), the fifth Dalai Lama, overthrew the king under the patronage of Gushri Khan and established the Ganden Podrang Regime in 1642. In 1653, Lobsang Gyatso received the title of 'Dalai Lama' from the Qing Dynasty (1644-1911), which acknowledged the Dalai Lama as the religious leader of Tibetan Buddhism enjoying the superiority of conferment. In 1713 upon the ferment caused by the death of the fifth Dalai Lama, Emperor Kangxi (1654-1722) conferred the title of 'Panchen Erdeni' on the fifth Panchen Lama (1663-1737), hence an official recognition of the Panchen Lama as the religious leader of Tibetan Buddhism with authority equal to that of the Dalai Lama. In 1717, the Dzungar Mongols occupied Tibet, sacked the monasteries and deposed the sixth Dalai Lama. Having dispatched troops to drive out the Mongols and quench the internal turmoil afterwards, the Qing Government decided to accredit imperial representative officials in Tibet in 1727 and later bestowed on them local administrative authority equal to that of the Dalai Lama. By regulating high lama appointments, the reincarnations of the Dalai Lama and Panchen Lama, foreign policies, and monastery management s the Qing Government took firm control over Tibet during the following 200-plus years. In 1904, Britain invaded Tibet and the 13th Dalai Lama fled first to Mongolia and then to Qinghai Province under an arrangement by the Qing Government. From 1912 until 1949, the Republic of China took charge of the local administration of Tibet and the conferment of the Dalai Lama and the Panchen Lama. The Tibet Autonomous Region was established in 1965, starting a new chapter of Tibetan history.